A separate mouse and keyboard for your Chromebook aren’t the most obvious accessories for it. But, if you’re like me and you work at your desk in your home office, it really is. Just prop up your Chromebook on a laptop stand and hook up a mouse and keyboard to it. Works like a charm. Disclosure: Please note that some of the links below are affiliate links, and at no additional cost to you, I will earn a commission if you decide to make a purchase. Please understand that I try to find the best fit for the need with products made by great companies, and I recommend them because they are helpful and useful. Now I won’t be listing a whole slew of keyboards and mice here for you to pick from, you can do that over at Amazon. What I would suggest is that you pick the the keyboard and mouse shown here below and leave it at that. Why? Because this set is made for your Chromebook and Chromebox – it is THE Chromebox keyboard. The ASUS Chrome Wireless Keyboard and Mouse (90MS0000-P00010) is the only external keyboard/mouse combo on Amazon (or anywhere as far as I can tell) that has the ChromeOS keyboard layout. It has the Chrome OS-specific keys like a dedicated search key and no Windows key. That means you won’t get confused when you switch between the on-board and external keyboard. This is the keyboard Asus came out with to go with their Chromebox, which makes it the perfect choice. If you don’t like your Chromebook trackpad, you can get an external mouse. Your main options are Bluetooth and USB. The USB type uses a tiny USB receiver, so you don’t have to enable Bluetooth. Cons: It uses up a USB slot. If you’re working at a desk, it’s not a big deal to use a USB hub to connect your other accessories. Recommendation: The TeckNet Ergonomic 2.4G Wireless Optical Mobile Mouse. It’s very inexpensive, and it’s well-loved. The Bluetooth type of mouse connects directly to ChromeOS, but first make sure your Chromebook has Bluetooth. Doesn’t take up a USB slot. No USB receiver to get lost. Bluetooth must be enabled on your Chromebook. Recommendation: Logitech M535 Compact Bluetooth Mouse. This model features a compact size ideal for your laptop bag and a long battery life (up to 10 months between battery changes with normal AA batteries). Up Next: read about the other main accessories you can get for your Chromebook. Chromebook accessories make it that perfect machine you can’t do without. Yes, it’s quite perfect all by itself already, but there are those cases in which you could do with a little more oomph, quality or comfort than you get with a standard Chromebook. And since the adoption rate of the Chromebook has pushed it past the status of dinky niche product into mainstream computing as a serious competitor to Windows machines we can now welcome many great accessories to go with it. To make it a little easier for you picking the desired accessory I’ve grouped them into easy categories. If you like the product category just click the name and it will take you to the page. One thing you won’t find on the back of a Chromebook is that trusty old parallel port we’re used to for hooking our printers up to. That doesn’t mean however that printing documents is now of limits for you. On the contrary, Google didn’t just build a Chromebook, it build an entire ecosphere to with it and printing is part of that. The answer Google came up with is a new technology that connects printers to the internet called Google Cloud Print. It allows you to make your printer available via the web, to any other person (machine rather) you’d want to grant access to. Even better, Google Cloud Print works on more than just a Chromebook, it works on your Chromebook and on your phone, tablet, PC and any other web-connected device you want to print from. Great isn’t it? I’ve compiled an extensive list of Google Cloud Print ready printers here. They’re the great multifunctional print and scan machines we’re used to only now with the option to access them through the internet. A lap desk can be a lifesaver when it comes to preventing lap burn and giving you the needed support when sitting in the couch or working from a chair. But that’s not all. There is a whole assortment of lap desks in all shapes and sizes, categories even that do a lot more than just give you support. They can be lifestyle enhancers too. Did you know that there are nice looking Designer Desks that not only help you work but also make you look good? Or what about slick looking Executive Desks ready for the boardroom? Or even Tech Desks, desks that can house an array of different devices so that the working professional can feel right at home? No? Well, I sure didn’t. But they do exist, and are actually quite nice. One, the Lap Desk 45075 Old School [affiliate link], makes me feel like I’m back at school again. I might just buy me one. It’s in the overview I’ve made of some of the most popular and beautiful lap desks I good find. 1 – off-site backup – If the house burns down, how will you get your memories back? You’re a winner with a Chromebook, because 2 and 1 are combined when you go for the Google Drive+External drive option. Pretty much any external drive will work with Chrome OS as long as it is formatted the right way. Just make sure it connects using a USB. A list of Chromebook compatible external drives can be found here. These are just some of the accessories that I’ve written about on this site. For mice, headphones, and other basics, check out Must have Chromebook accessories. I’ve often written about the benefits of Chromebooks: affordability, portability, and usability. Today, we’re going to discuss one of the drawbacks: limited storage space. Chromebooks come out of the box with only a little storage space because the entire Chromebook concept is built around storing things in the cloud. To fix this, use a Chromebook compatible external drive. These are my top three picks. You can read a lot more detail about each type of external disk drive below. What is an External Drive? Are there Different Types? Sometimes called a “flash drive” or a “USB stick,” these drives became widely used in the last decade. They are the most portable option, since they fit on a keyring or in a pocket. Continuing advances in storage space make thumb drives attractive, as well. You can easily find affordable thumb drives up to 500GB. However, they have generally fallen out of favor due to security concerns. In fact, some businesses (and the entire US military) forbid their employees from even having one in the building, much less plugging one into a computer. Since it’s pretty unlikely that you will be working with classified info, you’ll find one reviewed below. Originally, computers stored data on spinning “platters” with “read arms” that moved inside the device. It was a tremendously bulky way to store data. In fact, one of the first office computers held just enough data for one MP3 song–but it took the equivalent of two refrigerators’ worth of space to store all the platters! Thank goodness, we’ve gotten more efficient over time. They are now quite portable, but the moving parts inside make them vulnerable to accidents. These Chromebook compatible external drives will be designated HDD below, for Hard Disk Drive. Eventually, we figured out how to store data on a series of interconnected flash chips, rather than on a spinning drive. These SSD drives are more efficient than HDDs in both power consumption and physical space. There are SSD drives now that will hold multiple terabytes of data, which makes those refrigerators in the previous paragraph look ridiculous. Additionally, SSD drives boot much faster and are well on their way to being the standard in most laptops and desktops. Why do I Need a Chromebook Compatible External Hard Drive? Well, you might not. For many users, the storage on the Chromebook itself, plus the 100GB of free cloud storage, proves sufficient. However, you may have files you simply don’t want floating around the internet. If your Chromebook and Google account were acquired through your employer, then all the information on the Chromebook and account may revert to the them if you ever leave the job. In that case, it may be helpful to keep all your personal files or information you might need long-term on your own backup location. Or you may need an efficient way to get information back and forth from your Chromebook to other devices, and email isn’t always a good option–particularly for larger graphics or media files. Pretty much any external drive will work with Chrome OS. Just make sure it connects using USB. Some drives come with software that adds features. That software will not work on Chrome OS. Any drive you get will just be a blank storage area for you to save files. Which Chromebook Compatible External Drive Should I Buy? The SanDisk Extreme CZ80 is the best intersection of price, speed, and capacity. At under 30 bucks for 64GB of storage, it will easily hold plenty of information. 64 GB is enough to hold about 13,000 photos or 5 hours of video, so if you need a Chromebook compatible external drive for work-related media files, you’re not going to run out of space. I also love both the design and the capacity of this 128GB Sandisk drive, but it’s actually so small I found myself worrying constantly about losing it. I switched to a less “micro” solution. If you’re just looking to boost the capacity of your Chromebook, and you don’t plan to move the drive around between computers, this would be a great option. I like the Seagate Backup Plus 4TB model. Seagate has long been a go-to name in external drives. The first external drive I ever bought for work was an old Seagate 32GB for my dinosaur desktop. It costs about twice as much as the 64GB USB drive above, but 4 TB is enough space to store basically anything you’ve ever created in your lifetime. You may encounter faster “hybrid” models, which divide the read / write process across two drives working in tandem. However, the faster HDDs with two drives are twice as likely to fail, since there are twice as many drives enclosed. In my opinion, it’s worth sacrificing some speed to pick up more reliability and affordability. SSDs in the terabyte range are still (for me) prohibitively expensive. In my theoretical dream backpack, I have this 2TB Samsung model, which costs…a lot. But in the real world, I’m not going to spend that much. Instead, this 500GB Samsung T3 Portable SSD costs a fraction as much. It’s still a bit spendy. The increased efficiency, speed, and reliability of an SSD drive makes it worth losing some capacity. Since SSDs don’t have moving parts (like HDDs), this drive could still be working when your grandkids find it in the attic one day. And 500 GB is still more than enough space for most users. Unless you’re editing feature-length films, you should be fine with this option. How do I Use My External Drive with My Chromebook? Step 1: Plug it in to the USB port. Step 2: Open the Files program through the Launcher to see the files. Step 3: Eject the drive when you are finished. Thanks to the wonderful people at Google, this part has exactly one step: plug it in. There are no drivers to install. The drive is powered via the USB slot, so there are no extra cords to worry about. And your Chromebook will format the drive properly the first time you plug it in. You can access the files through the “Files” tab under the Launcher. The external drive functions just like a hard drive on any other computer. You can break it down into folders, subfolders, and individual files using whatever system works best for you. Just remember to “eject” the drive before you unplug it. The “eject” button should be next to the device name in the Files window. This makes sure you don’t unplug the drive while the Chromebook is still writing data to it. That could damage both the Chromebook and the external drive. There you have it: five separate options. My preference is for the Seagate Backup Plus 4TB model. I love the truly massive capacity of 4TB of data for a reasonable price. I only need a Chromebook compatible external drive to safeguard crucial files I keep from past jobs, family photos, and other things that I rarely move around. For that reason, my preferred choice right now is the Seagate. It’s got low cost and huge capacity going for it. It’s not as portable as the other options, but that’s not as important to me. If portability is your primary goal, perhaps one of the other options would work best for you. The lap desk is by no means a modern day invention. They have been around for a very long time. Founding father Thomas Jefferson drafted the Declaration on one, or parts of it at least. That particular lap desk is now kept at the Smithsonian, in case you’re interested at taking a look at it yourself. Lap desks can also be referred to as a writing box, portable desk, or lap rest. Lap desks have come a long way since then and are available in many different models. You have basic styles that are a plastic top with a cushioned underside, and they come in larger and smaller models. Then you have classic wooden ones. There are also high-tech ones that are like having your whole office with you. The first thing to consider when choosing a lapdesk is whether you want one that sits with a pad directly on your lap with padding or stands up on legs for a little more height. If you plan to sit on different surfaces, the cushion type is best. If you have a firm sofa or bed, the standing kind will work great. The other thing to consider is whether you want storage inside the lapdesk. Will your laptop desk be your main desk when you’re at home? You can get a lap desk that has capacity for paper notebooks, cords, and your USB mouse. One thing you shouldn’t really need in a Chromebook lapdesk is a fan. Chromebooks generally just don’t overheat, so you can skip that feature. Disclosure: Please note that some of the links below are affiliate links, and at no additional cost to you, I will earn a commission if you decide to make a purchase. Please understand that I try to find the best fit for the need with products made by great companies, and I recommend them because they are helpful and useful, not because of the small commissions I make if you decide to buy something. Please do not spend any money on these products unless you feel you need them or that they will help you achieve your goals. I love the look of this all-purpose yet simple lapdesk. It looks the most like the one I have. It has a large surface but is lightweight. Now, if you want a little more height to your pillow lapdesk, and you could use some storage, this one is perfect. It has a slide open divided compartment, which is handy if you don’t want things sliding all around when you move the laptop desk. It comes in black, too, but the zebra pattern is quite fetching. For the traditionalist or the interior design stickler, there are wood options. You can be a couch surfing executive with this wood lap desk. The angle is adjustable, independent of an area for the mouse, and it even has a little drawer for easy access while the desk is in use. If you want the wood look but need a pillow style instead of one with legs, check out this schoolhouse style lap desk. The ultimate lap desk, if you want to take your office with you, is this one. The leg height is adjustable, as is the surface angle. It has storage and a mouse area. But this one’s just getting started. It has has a lamp and USB hub, too. After you’ve gone all hipster boasting your Chromebook an’ all, you probably don’t want to get caught using some kind of an old clunker for a mouse, end up looking all pixelated on your Google plus Hangout or come across garbled while on a Google Talk session, now do you? Not to worry, there are great Chromebook accessories out there that will make you shine in all your beauty. Disclosure: Please note that the links below are affiliate links (all but one I think), and at no additional cost to you, I will earn a commission if you decide to make a purchase. Please understand that I try to find the best fit for the need with products made by great companies, and I recommend them because they are helpful and useful, not because of the small commissions I make if you decide to buy something. Please do not spend any money on these products unless you feel you need them or that they will help you achieve your goals. Since one of the most frequently asked questions is “Can I use a … with my Chromebook?” I thought it’d be helpful to create a resource page with the most needed accessories to use in combination with your Chrome device. I’ll add to this as I learn more, so you’ll notice that in the future I will reference this page quite often. I hope you’ll enjoy! When picking a mouse the obvious choice is to go with Samsung’s own series of mice which work fine with the Chromebook. 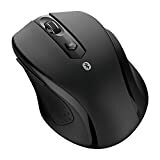 The one I’d recommend is the AmazonBasics Wireless Mouse with Nano Receiver because of it’s ease in use. All you need to do is plug in the little USB plug that stores away in the bottom of the mouse and you’re good to go. Be ware though! The Chromebook Series 3 has only 1, yes one, USB 2.0 port. So if you decide to get a USB mouse you’ll either be out of USB ports, or you’ll have to get a USB hub to go with it. They’ll go from about seven dollars and up, so not too much money, just something to keep in mind. Another option is a to go with a Bluetooth mouse. The thing to keep in mind, and check for, is that not every Chromebook has Bluetooth. It is in the 1st generation Acer A700 and the relatively new Asus Chromebox, but not in all the series 5 or the newest Samsung Chromebook for example. So if you’re looking to connect your trusty wireless mouse you can do so, though you’ll need to plug in a Bluetooth dongle to make it work or get the latest Chromebook that does have Bluetooth. It is Bluetooth 4.0™ Compatible. Time to make you look good. Depending on the type of Chromebook you’re using you’ve either got a nice onboard HD Webcam that works well with GTalk and Google+ with its Hangout feature or you’ve got a somewhat okay VGA webcam at a measly .3-Megapixels. The first one being the Series 5 550, the latter the newest Chromebook. When you’re just into hanging out with your friends or doing a bit of one on one G-Talking, you’re fine, no need to buy anything extra. But, when you’re planning on joining Leo Laporte on TWiT you better get some gear. Don’t really know what 1080p HD looks like? Check out these scenes! And remember, make sure it displays at 1080 as Youtube defaults it on a crappy setting which is not even close to as awesome as 1080p HD is! Unlike with any Windows or Mac machine there’s no guarantee that the webcam you pick works with your Chromebook. This complicates things a bit in choosing a great webcam, but it shouldn’t hold you back either. The ones I show here are two great ones that have been reported to work on Chromebooks in the wild. I myself use the Logitech C920 depicted below for professional Hangouts on a daily basis. Google has even made it the camera for their Chromebox for Meetings product, their conference tool for small businesses. The C920 is that good of a webcam slash camera. Now remember, being on TWiT or your companies cost-effective, easy-to-use video conferencing solution requires 1080p HD equipment. 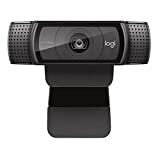 With Logitech HD Pro Webcam C920 you get exactly that. Full HD 1080p video, high quality dual mic for stereo audio and more. It’s even better than it looks because the H.264 video compression is done in the camera itself! You heard that right, we are talking about built-in hardware compression here. Usually a webcam captures the video and sends it in an uncompressed stream to the computer, where the main processor (CPU) performs the video compression. By having the camera perform the processing, it is possible to have excellent video quality, even on a mildly powerful computer. To me that makes this particular one the webcam to get for your Chromebook. The best thing is that it doesn’t run you broke either, you can get your hands on one over at Amazon. If you’re anything like an average chrome user, you’ll find yourself using Google Talk/Voice and Google Plus Hangouts more and more. If so you will undoubtedly run into the limitations of the on-board microphone on both the old and new Chromebook models. They’re fine for a quick call to a friend, but lack the quality for continuous or professional use. A shortcoming, especially during those important calls when quality of sound is important. Not to worry though. You can use wired or wireless microphones and headsets. The Buddy FlamingoMic 7G Portable is a 17″ unidirectional noise cancelling microphone. It has a specially designed L shaped USB connector, designed especially for the Chromebook, notebook, netbook and tablet PC. This microphone is ideal for use with all portable devices. Contort this microphone into any desired position to suit your needs. The use of FilteredAudio technology makes this by far Buddy’s highest quality FlamingoMic to date. The unrivaled combination of highly accurate speech recognition results and ease of use makes the Buddy FlamingoMic 7G an ideal product for use both at the office and on-the-go. If a headset mic is not for you because of pain in the neck or because of –the most common complaint by people– you feel silly wearing it, the FlamingoMic is for you. It plugs into the USB port and easily coils up neatly against your computer for portability and easily extends for dictation. Oh yes, and you have both your hands free to use the mouse and keyboard, flip through papers or hold your cup of coffee. 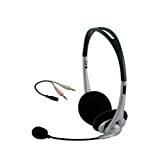 When a headset is more your cup of tea then the next generation headset microphones, the GE Universal All in One Stereo Headset series is the way to go. It has adapters to connect the headset to various different devices. It can connect to mobile phones, tablets and Chromebooks with the 3.5mm connector, computers with separate 3.5mm input and output ports, or VOIP phones with the 2.5mm port. Very important for you to remember that the Chromebook sports a 3.5mm TRRS connector which is not your everyday connector. The GE Universal Headset is ideal for pairing with devices such as a Google Chromebook simply because it comes with such a TRRS connector, making it one of the must have Chromebook accessories. There are a lot of people who have bought into the whole cloud computing / Chrome OS story and gotten themselves a Chromebook, but who don’t want to store their stuff online only. A perfectly legit stand to subscribe to, I do so myself. It’s not that I’m not afraid of security or privacy issues. If your data is safe from hackers anywhere it’ll be on Google’s servers, and when it comes to privacy you’re again best off with them. I store locally for two main reasons. #1 You have no control over the entity holding your data. If they decide its time to end your account, for whatever reason, you’ve lost all of your data. Now data doesn’t sound very bad, so think of it as your family photos, contracts, financial statements, your contact list that took your life to build, everything. Reason #2 is that I need to be able to get to my data all the time. Being online 24/7 does do the trick. But that’s not always possible. When I’m relaxing at the family lodge in France, for example, I don’t have internet. Also the company I work for has had a dozen outages of the wifi network this past year. Some lasted for days. In these kinds of situations I want local storage and being limited to the 16GB of on-board storage that is a bit of a problem. The cool thing is that the Chromebook recognizes and works with external drives, so if you want to you can carry an external SSD with you. And when you connect using USB 3.0 (make sure you know which port on your Chromebook is the 3.0 port) you get data transfer at blazing speeds. I wrote up an article to help you choose the best external drive for you. And there you go. These are some of the must have accessories that make your Chromebook come to life and have you rock yours like a pro. There are of course many more things that could go into your Chromebook ecosphere like the right cloud printer or a nice lap desk for comfortable computing on the couch or in your La-Z-boy recliner. Thank you for visiting ChromebookHQ, I hope you found this article helpful. If you have any questions, please leave a comment and I’ll make sure to answer you. Can I use a headset with a Chromebook? If you’re anything like an average Chromebook user, you’ll find yourself using a headset with Google Talk/Voice and Google Plus Hangouts more and more. If so you will undoubtedly run into the limitations of the on-board microphone on both new Chromebook models. They’re fine for a quick call to a friend, but lack the quality for continuous use. A shortcoming, especially during those important calls when quality of sound is important. Not to worry though. There is an excellent solution, or two actually. The Buddy FlamingoMic 7G Portable is a 17″ unidirectional noise-canceling microphone. It has a specially designed L shaped USB connector, designed especially for the Chromebook, notebook, netbook and tablet PC.